Transport and parking - Faringdon Community Website. 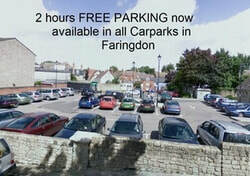 There are 2 car parks in Faringdon, both in easy walking distance from the Market Place and both offering 2 hours free parking. These car parks are open 24 hours a day and chargeable Monday to Saturday (including bank holidays) from 8am until 6pm. Free on Sundays. A valid ticket must be displayed at all times during the charging period - including for the free two hours. 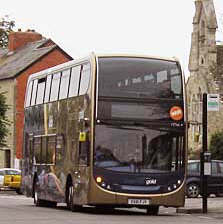 The Faringdon Community Bus operates a timetabled service, No. 61, in and around Faringdon and Great Coxwell every weekday morning, except Bank Holidays. There are frequent buses from Oxford to the Churchill, John Radcliffe and Nuffield Hospitals. Buses from Swindon centre to the Great Western Hospital are frequent.